Recently a friend of mine posted on Facebook a link to a Buzzfeed article “13 Children’s Books That Encourage Kindness Towards Others.” Admittedly, I am familiar with only two of the books on that list. One is the Dr. Seuss book “Horton Hears a Who,” which certainly fits the bill. The other, however, is Shel Silverstein’s “The Giving Tree,” and I must object to their including this book on their list. My biggest problem with “The Giving Tree” is that for me, the boy does not really love the tree at all. While it seems that way to being with, as he grows older, he becomes more and more selfish, and instead of just enjoying the company of the tree, he starts taking bits of it away, until all that is left is a stump. Then, the biggest insult is that when there’s nothing left for the tree to give him, the boy continues to use the tree for his own comfort – as a seat to rest upon. Now, if this had been my book, I would have had the boy plant a sapling every time he took something from the tree. That way, as the years went by, the tree would have younger trees to keep it company. Then, when the boy finally returns as an old man, they can enjoy each other’s company once again, while also surrounded by all the new trees that the boy gave back as well. In this way, they would know that eventually, other boys would have the benefits of being friends with the trees and the joys of communing with nature. Of course, I’m not a writer of children’s books, and my readers know that I seldom review them for this blog. Nevertheless, there was a time when I had young children, and I too looked for books to read to them that were not only fun, but also had some kind of positive subliminal message. However, one of the books I chose to read to my kids, “Where the Wild Things Are” by Maurice Sendak, was for fun and not any particular lesson that it might teach my kids. However, come to think of it, perhaps it did teach my kids something. That being, that even if they do something I’m unhappy with or I’m angry with them for some reason, they will always find that I still love them. That’s not a bad lesson to learn in any language, if you ask me. Unfortunately, I’m not sure I can’t suggest that particular book to replace “The Giving Tree,” because the Buzzfeed article was about books that encourage kids to be kind, and that’s not exactly the point of Sendak’s story. However, I noticed that one of the books they included was Dr. Seuss’ “Horton Hears a Who,” which actually is a good choice. Despite this, and as nice as that book is, it wouldn’t have been my first Dr. Seuss choice. That would be his “The Sneetches and Other Stories,” and here’s why. The book in question has four stories. The copy I bought only had two stories – The titular Sneetches story, and the last story in the collection, “What was I Scared of?” The Sneetches tells the story of two types of Sneetch – ones born with stars on their bellies and ones born without. The ones with stars thought themselves to be superior to those without, until someone comes along with a machine that can put stars on the plain-bellied Sneetches. When this outrages the original star-bellied Sneetches, he produces another machine that will remove the belly stars. With adorable humor and charming rhymes, the creatures keep putting on and taking off their belly stars until they haven’t any money left to pay for the transformations. Of course, this is where they learn their lesson. That being, no one should act or feel superior to anyone else because we’re all just an accident of DNA and birth, and there is nothing we can do to change that, no matter how hard we try. The other story, “What was I Scared of” is about a person who keeps coming across a pair of pale green pants with nobody inside them. This freaks him out a little more with each encounter. However, when he finally goes full-scale panic at one meeting, the pants start to cry. It is then that he realizes that the pants were equally as scared of him, and they become friends. The point of this story is that we shouldn’t allow ourselves to be afraid of people we’re unfamiliar with, just because they’re different. We can allay those fears if we just allow ourselves to get to know them. In these days of increased violent incidences of racism and xenophobia that comes directly out of unfounded fears, this little story speaks volumes to fight exactly these things. To reiterate, if you’re looking at Buzzfeed’s list for books to buy your kids this holiday season that will help them be kinder to others, more inclusive and less fearful of other people, I cannot recommend “The Giving Tree,” to be one of them. 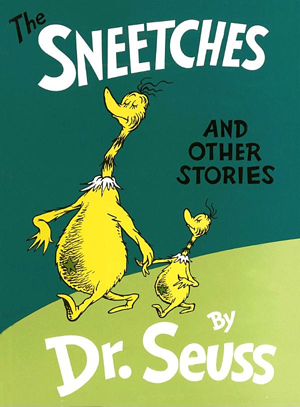 Instead, I highly recommend you get them Dr. Seuss’ “The Sneetches and Other Stories,” and read them both the titular story as well as “What was I Scared of,” as often as possible, and thereby teach your children how to be kind and tolerant. “The Sneetches and Other Stories,” by Dr. Seuss is available from Amazon, Barnes & Noble, Kobo Books (USA, Canada & Australia), iTunes (iBook or read-and-listen book), The Book Depository (free worldwide delivery), new or used from Alibris or Better World Books as well as from an IndieBound store near you.